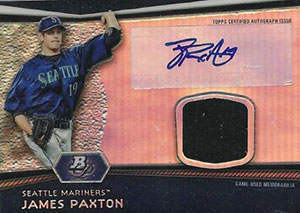 James Paxton was born on Sunday, November 6, 1988, in Richmond, British Columbia, Canada. Paxton was 24 years old when he broke into the big leagues on September 7, 2013, with the Seattle Mariners. His biographical data, year-by-year hitting stats, fielding stats, pitching stats (where applicable), career totals, uniform numbers, salary data and miscellaneous items-of-interest are presented by Baseball Almanac on this comprehensive James Paxton baseball stats page. Did you know that James Paxton was only the second pitcher in Major League history to go 4-0 in his first five games, all starts, with an ERA under 1.25? The first? Boo Ferriss , of the Boston Red Sox , who won his first five starts in 1945 , while having a 0.60 ERA!